Welcome to the Ernest Hemingway Home and Museum web site. Located at 907 Whitehead Street and nestled in the heart of Old Town Key West, this unique property was home to one of America's most honored and respected authors. Ernest Hemingway lived and wrote here for more than ten years. Calling Key West home, he found solace and great physical challenge in the turquoise waters that surround this tiny island. Step back in time and visit the rooms and gardens that witnessed the most prolific period of this Nobel Prize winner's writing career. Educated tour guides give insightful narratives and are eager to answer questions. Wander through the lush grounds and enjoy the whimsy of the more than sixty cats that live here. 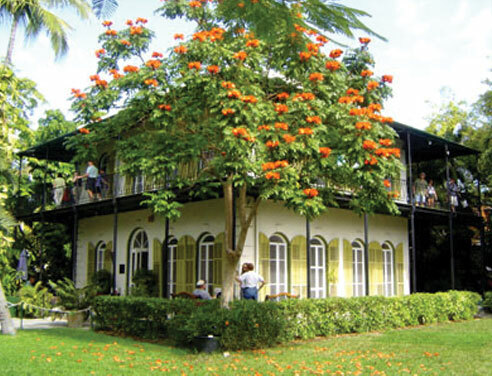 The Ernest Hemingway Home and Museum is a significant address on any Key West itinerary. The museum welcomes thousands of visitors from around the world each year and looks forward to welcoming you!